The entire Louisville basketball staff was there to watch 4* PF Jaylen Johnson today according to @DoriansPride. 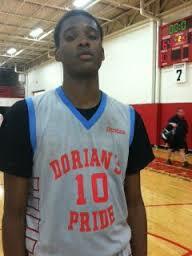 Johnson is a 6’9 PF out of Michigan with a very versatile skill set. Johnson was on the Louisville campus not to long ago and came away very impressed and since that time Pitino has tracked his progress a various tournaments, but now Johnson seems to be moving up Pitino’s wish list. And when you have a sequence like this: 4 star PF Jaylen Johnson assists on a dunk, jams one down himself, takes a charge and then gets another bucket. Team now up five (@CmAnderson247) its easy to see why Pitino loves Jaylen’s game. Johnson currently holds offers from Louisville, Iowa St, Maryland, Michigan St, Arizona St, Cincinnati, FSU, USC, Vandy, and VCU with many more offers sure to come. Pitino is positioned to take more than 1 PF and whether Johnson is one of them or not the interest is there from both sides and Jaylen Johnson is a name to keep close eye on.